Isle of Eriska Hotel & Spa is located on a 300-acre magical island in the west of Scotland overlooking Loch Linnhe and the dramatic Morven mountains beyond. The hotel dining room is the amalgamation of four areas, firstly the morning room with views over the lawns to the south, secondly the business room which catches the morning sun then the butler’s pantry which joins the two earlier rooms together and finally the conservatory which was added in 2002 with views under the boughs of the Oak planted the year the house was built. Menus are designed using the hotel’s amazing natural larder, stocking produce from the island and locality. Foraging is a big part of creating menus as well as using the kitchen gardens and greenhouses to create seasonal dishes. 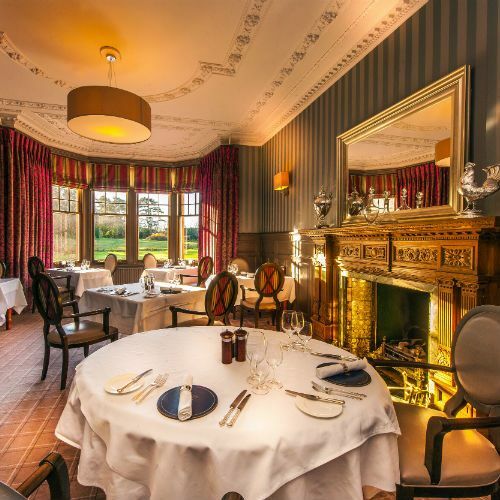 This gift voucher entitles two people to dine from the A la Carte menu at the Isle of Eriska Hotel. Pre-booking is essential. For further information, online booking and sample menus, visit www.eriska-hotel.co.uk. Gift vouchers are valid for 12 months from the date of purchase.